And here’s a video that I feel like posting because I can. Okay, kids – be good, have a nice holiday week, and I’ll see you in the new year. Now go forth and conquer! We interrupt your regularly scheduled LOL Friday/Monday Video/Tuesday Whatever The Hell I Want to bring you three more music gifts while there’s still time to get them delivered by Christmas. After that I will resume posting my usual ridiculousness, as opposed to this unusual ridiculousness. Mozart for one night only, guys! Quick, hop in your time machine and make a beeline for 1786! Then we can ALL say we knew about Mozart before he was cool. The concert tee print comes as either a t-shirt or a hoody over at Threadless, and it looks like they’re having a sale today, so I’d hurry if I were you. The perfect gift for… just about anyone who likes classical music, really! Can’t overcome your dislike of Mozart? It looks like the Chopin and musical typewriter shirts from last year are still available. If that’s not punny enough for you, the Ain’t Baroque store has you covered – t-shirts to inform people they can’t see you ’cause you’re Haydn, that you’ve got to go but you’re Offenbach, and more; plus stickers, mugs, etc. etc. Check it out! Musical wine glasses! And at $65 for what appears to be two wine glasses, it’s a LOT cheaper than the theremin, although admittedly kinda expensive for wine glasses. But look, these wine glasses are special – they’re musical! Along the side they’ve helpfully printed note markers, so if you want to tink your fork against you glass and hear a D natural, you simply fill the glass to the D natural marker and go to TOWN on that boy. Line up a couple and recreate that scene from Miss Congeniality! Find them at Firebox. Still not cost-effective enough for you? Not a problem – check out the Ain’t Baroque store, fine purveyor of Beethoven stickers (you did notice that it was his birthday yesterday, right? ), terrible music puns, and Russian composer cows. I know, it looks like a boring ol’ make-your-own-music-box kit. And if you want to just slap the included “Happy Birthday” sheet inside and call it a day, you can do that. BUT! It also comes with three blank sheets and a hole punch, so you can punch your own music! Got your own personal composition? Include it. Want a music box that plays some of the more twelve-tone-y Schoenberg? You can have that too! Your giftee can hear any work your little heart desires; or leave it blank and let them create their own. And you even have the option to purchase a refill pack if you want to punch more pieces. The kit itself runs you $14.99 at ThinkGeek, with $4.99 for the refill packs. Looking for something a little less labor-intensive? Why not investigate the Ain’t Baroque store? 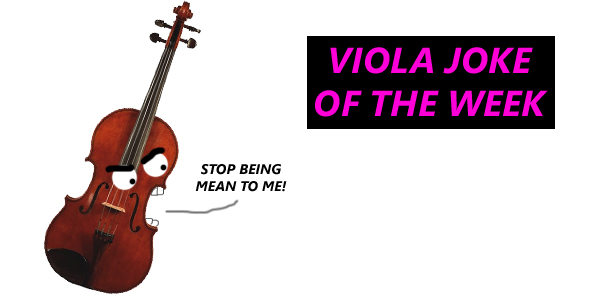 Trust me, you’ve never seen so many music-related puns and insults to violists in your entire life.